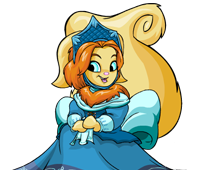 NOTE: Your Neopet is using old-style artwork and cannot wear items. Click here for more information. It appears that you do not have a recent version of Adobe Flash Player installed. To use certain features of our site, you will need to install it. What is the NC Mall? The items on this page are only available if you purchase NC. For more information, go here. Wearable NC items cannot be applied to unconverted Neopets or the following painted Neopet body types: Maraquan, mutant, baby, invisible, and fruit and vegetable Chias, unless specified in item details. The NC Mall features some NC items that are only wearable with specific painted Neopet body types such as baby. Non-handheld Accessories are also not compatible with the body types mentioned above. Backgrounds and Trinkets will display properly for all body types. NC items may not be exchanged for NC, Neopoints, or Neopoint items. Some NC items may be sold for a limited time only and/or be limited to a specific number of uses (most items offer unlimited uses). Please review the complete details of an item (by clicking on it) before purchasing it. All Sales are final. There are absolutely no refunds. You must have parental permission or be 18 or over to make a purchase.